special categories of personal data, described in Article 9.
legitimate interest(s) of the controller. The special categories of personal data are items that require additional protection and consideration, as these attributes of a person could be used to discriminate against or otherwise target a person. The special categories of personal data are also referred to as sensitive personal data – as they bring an additional level of sensitivity – and therefore require additional consideration. any one of a number of specific legal or public interest situations (spelled out in Article 9) that require processing of this data exists. In general, compared to Article 6, Article 9 imposes tighter conditions for allowing processing. Lastly, GDPR Article 10 gives additional protection for data relating to criminal convictions. From the point of view of automating the detection of personal data, both “basic” personal data and the special categories pose technical challenges. Personal data such as Names and Addresses can often result in false positives unless the detection algorithm is sophisticated. For example, in an unstructured document, a given name such as “April” without more context might be mistaken for the name of a month. Similarly, since many street or city names are also legitimate last names of individuals, confusion can arise without a sufficiently strong detection method. An example of this is an address such as 12343 Washington Blvd., Fremont CA. Both Fremont and Washington are legitimate last names, street names, or city names. The ordering of the elements in street addresses also varies widely across countries. Since GDPR covers the European Union (EU), and the EU has 28 member countries (including the UK, which is committed to implementing GDPR even after leaving the EU), the addresses in these countries will need to be detected. Therefore detecting “basic” personal data requires a sophisticated approach. The special categories of personal data present an even greater challenge to automated detection methods. The reason for that is most of the items in the special categories don’t have a tight, formally expressible definition. For example, finding someone’s political leanings as part of an automated scanning program, especially in an unstructured document, is a non-trivial exercise, though a human reading the same document can easily glean this information. Indeed this is where machine learning (ML), training of the ML module, and customization play heavy roles. The automated system of detection must be highly customizable and trainable in order to be effective in finding data that fall under the special category. Lastly, all of the above algorithms need to operate on data sizes that are exploding. Scalability of any detection algorithm is critical for it to be successful in a real-world GDPR production context. So far in the context of GDPR, we have covered detection of personal data and protection methods for personal data. In the next post of this series, we will be discussing other aspects of GDPR, namely, breach detection and reporting. 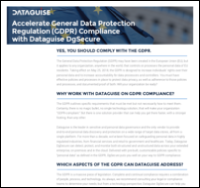 Interested in sensitive data discovery and data classification solutions from Dataguise DgSecure? Please contact us anytime for more information. Enjoy DgSecure OnDemand FREE for 7 days when you signup today. No credit card required!